Customer relationship management (CRM) implementation is the process of setting up and running CRM software. Careful planning is required to ensure the system’s setup, integrations, customization, testing, and reporting are aligned with company goals. A successful implementation involves all team members from the start as well as ongoing training to improve efficiency and user adoption. In this guide, we assume you already have a CRM. However, if you don’t, consider Freshsales. This is a fully-featured CRM offering a free plan as well as three-tiered pricing plans to help teams of any size optimize and improve their sales and service. Find out more about Freshsales’ capabilities by visiting its website and signing up for a free 30-day trial. Here are the five steps for a successful CRM implementation. An implementation plan will ensure you’ve considered the right foundational steps for a successful CRM implementation. The planning stage involves choosing your implementation team, establishing goals for the system and its use, determining what existing data will need to migrate into the new system and creating a basic timeline. However, the most important part of this stage is to include all potential users in your CRM discussions to increase adoption. 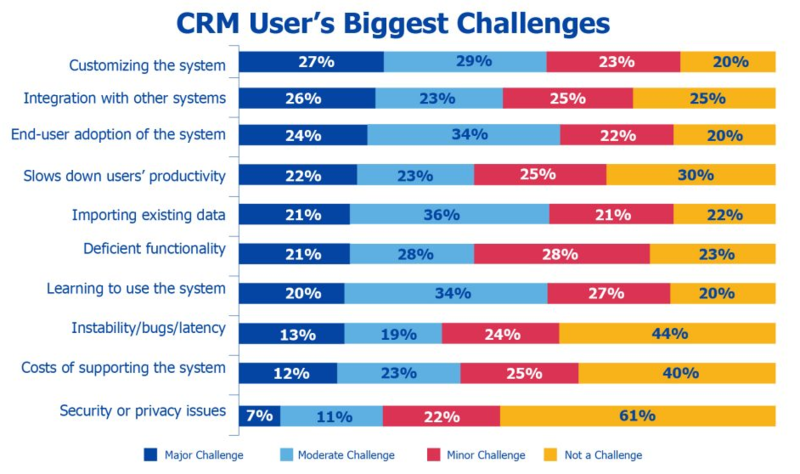 One of the top reasons CRM implementations fail is because of poor user adoption. Employees resist change. To improve adoption and reduce resistance, involve your team early and along every step of the way. Be sure to include sales, service, marketing, information technology, and any other team members that may touch the CRM. Emphasize the importance of the CRM implementation both for the success of the company and them individually. Several years ago, I worked with a company that was considering a move from their long-time CRM to a new platform. As expected, there was some resistance, so I scheduled several group calls with all the company’s current CRM users. Team members asked questions as I showed them around the software. I explained why my use of the same CRM helped me become more efficient and close more deals. I showed them how easy it was to create deals, how to automate processes they were performing manually, and how to prospect using data from site visitor tracking. After many months of calls, emails and push back, they ended up buying the software and making the switch. It wasn’t because I “sold” them, but because they saw they could be more successful as a company and as individual sales representatives and, if nothing else, perform their jobs more easily. Depending on the size of your company, consider appointing a CRM administration, the person responsible for overseeing the CRM’s technical and administrative functions. For small companies, this role usually requires a small, but important time investment outside of an employee’s normal duties. Define the goals for your CRM by outlining how your team will be measured within the system as well as how the system is expected to be used or action plans. These goals and action plans should also support your overall strategic business goals and should always be top-of-mind as you move through the CRM implementation process and beyond. You do this by first defining high-level, strategic goals. Start with a few business goals to test the waters. You can always add more later. Next, create more tactical goals for your CRM strategy that support your high-level goal. If your high-level business goal is to increase revenue by 25% by selling into larger manufacturing companies, you might do this by asking questions about current prospects and those you intend to target in the future. Who are these companies and contacts? Is there a built-in prospecting tool that will help me locate them? What can we do with contact and company records in the CRM to have an impact on this goal? Can we better identify these prospects and how? What custom fields can we create that will ensure I’m pursuing the right targets, such as industry, revenue, job title, or decision maker? What webform questions should we ask that will help identify these contacts? Can we measure and track this easily? If so, how? How will this better help me track qualified or nonqualified opportunities? How will this new information help our marketing efforts? The answers to these questions will help you determine what other tasks or customizations are needed as part of your CRM implementation. For example, your plan may need to include tactical goals like create custom CRM fields and forms to help us better identify and capture 100 prospects at large manufacturing firms from prospecting within the first 60 days. You’ll also find that defining and CRM goals in one area of the business will holistically help in other areas. For example, the data fields you require to measure sales performance can help your marketing target specific industries and job titles. Check out our article for a more industry-specific CRM. Presumably, you have contact, company, deal, and related files that will need to be migrated or transferred into the new CRM, whether it’s from an existing CRM or another source. Contact, company, and deal data is typically exported or imported using a simple comma-separated values (CSV) Excel file or with an import tool depending on the product selected. However, all CRMs are a little different in how they handle data migration, so review yours to be sure what’s needed. 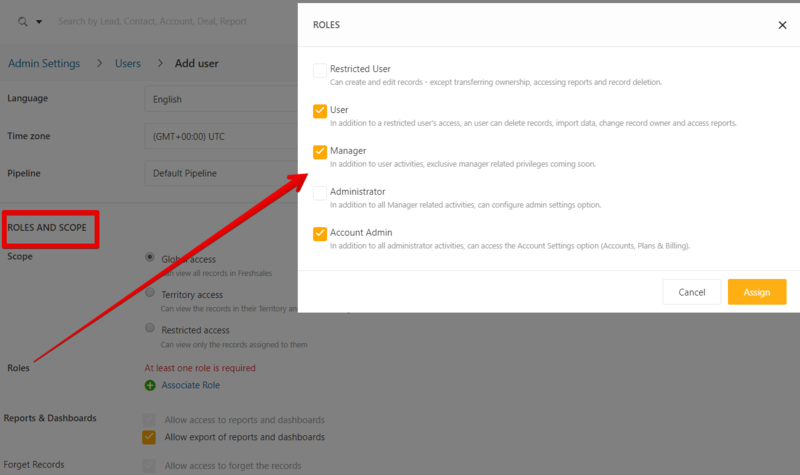 Admin settings with import options. This roadmap should include all of the steps involved in the implementation process, the specific time period for each, and an overall completion date. When building it out, review key objectives from your business plan that should be considered along the way. For example, to help meet the goal of reducing customer churn, your company will implement live chat software in the second quarter. You’ll want to answer when and how this will integrate with the CRM. Once you have created an implementation timeline, share it with your team and provide regular progress updates. A successful CRM implementation requires everyone on the team’s involvement. Teammates need to know what tasks are required, when they will be required, and who will be responsible to complete them to limit missed steps or potential bottlenecks later in the process. This step requires you to go through your system settings where you may be asked to define selections for drop-down menus, specify required fields, create sales pipelines, deal stages, or set user permissions. How you go about completing this step will depend on the system you have selected. Fortunately, many CRM will include core features with pre-populated examples for items like contacts and deals. If not, they’re easy to create. Before you start building out these functions, however, you should first define how your sales process works for each product or service from initial contact to closing the deal. The article How to Set Up Insightly provides a detailed look at a CRM setup example. Whether you’re a business-to-business (B2B) selling marketing services or a business-to-consumer (B2C) selling home solar panels, you want to define how you sell, such as what are the sequential steps taken to move a contact from to lead to prospect to opportunity to customer. Define this for each revenue generator if the process is different. The more complex the sale, the more stages you’ll have in the process. For each stage, determine the probability of winning the deal at that stage. Then, create the pipelines — the visual representation of your deals with associated stages. Plug in the information from your sales process to create both deal stages and pipelines. Keep this step simple. You can always change it as you go. We recommend using a drag-and-drop Kanban style ― as shown above ― as it’s easy to move between stages and is visually appealing. Pipeline with deal stages example. Determine what security permissions your CRM users will have. This will depend on two things: what each user potentially needs access to and what types of permission settings your CRM provides. The CRM admin, for example, will have complete access, but a sales representative may only need access to records in his or her territory. Most CRMs will include some degree of customized permission settings. Examples of settings include configuring admin settings, restricted record or contact access, importing, exporting, deleting records, deals access, reports access, and changing record ownership. Sometimes, there will be access level options within each of these to either view or edit. The bigger the team, the tighter you may want to restrict access at first. With CRM software like Freshsales, it’s easy to create deal stages for multiple pipelines for any business based on sales cycle and sales territory. It includes Kanban-style pipelines with a drag-and-drop function. Sign up for a free 30-day trial. 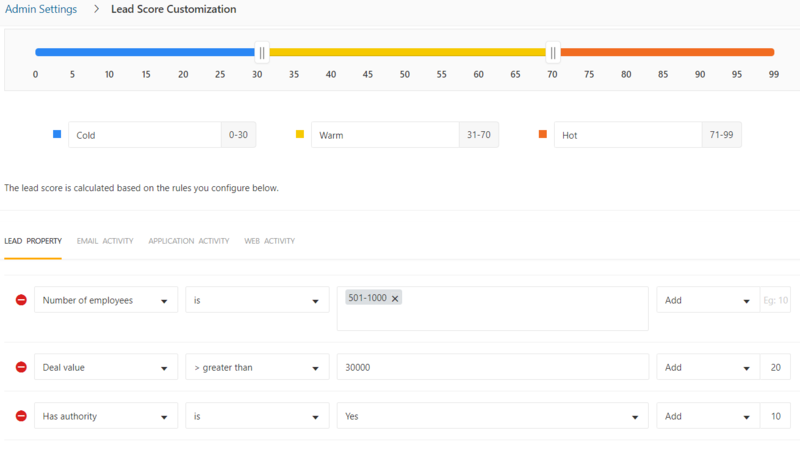 Customization allows you to tailor features to your business needs using filters, rules, automation, and lead scoring. These features are designed to help your sales reps become more efficient and your business better communicate with leads and customers. Ultimately, what and how you customize should tie directly back to your overall business goals. Adding custom fields expands your company’s opportunity to collect relevant data from contacts/prospects, deals and any other way you capture information. Every custom field should dovetail with your overall goals. For example, for contacts, what kind of data do you need to help advance you toward your goals? Is it job title? Company revenue? Lead source? Job title: Does this person have the authority to make a purchasing decision? Company department: Are they in the department that will be affected by what you sell? Company revenue: Do they qualify as a large business? A large business is one that has annual revenue of at least $500,000. Industry type: What industry are they in? Manufacturing or related is a plus. Source information: How you’ve acquired these types of customers in the past — trade show, organic search, or campaigns — is important, such as do campaigns produce better-qualified leads? Lead score (if available): This feature ranks prospects based on some of the above criteria plus actions they take with your company. It then assigns a value and helps sales prioritize them. Product: What do you need to sell more of to hit the revenue goal? Identify these in each deal. Expected close date: With larger deal sizes come longer sales cycles. Knowing close dates allow you to manage a longer process more effectively. Each of these fields is important to understanding a deal and whether it meets the criteria for improving revenue with a specific type of client. Making them required fields will help the sales rep determine if it’s a good fit, provide the sales manager the right deal context, and provide valuable data for understanding each sale. For more customization ideas, check out how to use Zoho. Creating routing rules will assign leads automatically based on predefined criteria such as geography, company size, lead score, and other contact properties. When the lead comes into the CRM, it’s then sent to the appropriate sales rep. There’s also usually an option to assign in a round-robin. The auto-routing eliminates the need for a gatekeeper. Let the features of your CRM work for you by automating processes, particularly those that sales reps perform daily. Create email templates for common communication like setting up meetings, responding to requests, and follow-ups. Most templates will use placeholders for contact fields that will populate the associated lead info automatically so that each one sent is customized. When you’re ready, you select the appropriate template and hit send. Canned snippets is a feature that allows you to create a typing shortcut for common responses. For example, your typical response to a pricing question might be: All of our pricing is customized. While I can’t tell you what your specific monthly cost would be, I can say the range is usually between $2,000 and $5,000 a month. Your snippet shortcut might be typing #pricing giving you 30 words for the effort of one. CRMs without email marketing are becoming the exception as most now offer this feature with varying capabilities. It lets you automate email communication at scale with both prospects and customers. For example, for visitors who trial software, you can send a series of emails introducing them to the product, sending helpful content, and providing a point of contact to help increase the chances of a sale. Work with your marketing team before creating campaigns to ensure messaging is consistent and not duplicated. If you’ve done this in the past and it worked, don’t reinvent the wheel. Use what you have. 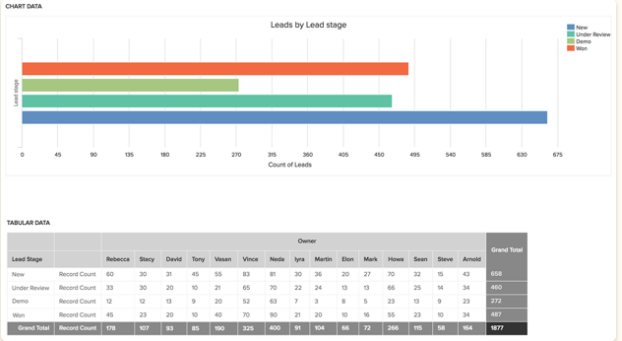 This feature can help reps identify the most sales-ready leads quickly using a predefined score based on that contact’s characteristics and behavior. Characteristics are the available contact properties like job title, company size, industry, and territory. Behavior filters for things like emails opened, pages viewed, and forms filled out. Once these filters are defined, reps will get a score for contacts that will update as different filter criteria are satisfied. Identifying scoring criteria is a worthwhile exercise for any sales team and can lead to valuable insight. When I reviewed the characteristics and behavior of customers for a marketing agency I worked for, I discovered there was sometimes a person within an organization that wasn’t the decision maker but who was responsible for starting the initial conversation with our agency. From this, we identified another buyer persona. With a CRM like Freshsales, you can create email campaigns for both leads and contacts. It also has advanced features such as lead scoring that can be used for better prospecting and the ability to create dozens of customized reports. Visit Freshsales for a free 30-day trial. Integrating your CRM with third-party applications allows you to maximize your organization’s sales and service capabilities and gives you access to additional features not found in your CRM. This may help with data migration, email, social media outreach connection, chat, and any other tools that may impact the way you handle sales and customers. What you integrate at this stage will be determined by your timeline — some may have to wait until you are ready. Depending on your CRM’s functionality and your requirements, you may have to enlist the support of a third-party software migration service. I worked with a client who was transferring data from an old CRM to a new one via CSV file and the new CRM didn’t recognize certain data fields like notes from the old system. They couldn’t afford not to have this data migrated, so they enlisted a service to do a custom migration. Problem solved albeit at extra cost. Pro tip: Do not move all your data at once. Test the integrity of the data transfer using a small sample first. Email integration should be straightforward with popular platforms like Gmail and Outlook. A CRM with basic email functionality should associate emails sent and received with contacts in the CRM to track conversations in both places. You’ll also be able to email directly from the CRM and know when an email is opened. As a salesperson, email tools were extremely important to me. I became addicted to knowing when and if prospects opened my emails. If it had been several days since I sent a proposal out and had not heard back from a prospect, the minute I was notified they opened my email, I would send a quick follow-up. I knew I was catching them when they were thinking about my solution and, as experience proved, was likely to get a response back right away. Email tracking: Tracks opens, clicks, and links clicked; advanced features will also provide metrics on documents viewed like proposals for things like time on each page, whether it was shared, and more. Email extension: This will integrate with your email inbox and provide details for your contacts such as email history, lead score, notes, and other contact-related info. Two-way sync: This records email conversations in both external and CRM-based inboxes. For teams that want to add a social selling component to their toolbox, connecting to Twitter, Facebook, LinkedIn, and Instagram can bring in additional, contextual insight to assist with prospecting and customer service. Not all CRMs have this feature and those that do have varying capabilities, such as allowing you to interact in social from the CRM. The good ones also pull in your contacts’ social accounts automatically if not also their social streams. CRMs usually have dozens of third-party integrations with platforms like phone systems, live chat, surveys, and marketing automation. There’s also a chance they offer some of these additional functions within their suite of software. Whether you need to connect these now will depend on your timeline. One CRM I used in a previous role had a built-in live chat that was very easy to install. As I was the only salesperson at our agency, it was also easy to manage as all inquiries came to me. I found it to be a quick way to qualify people. Often, I’d get a chat asking questions about our services, and it was easy to have a quick conversation rather than scheduling a call. If you’re considering this as a channel, check out our best live chat software article. If your CRM has one, download their mobile app. This will let you manage contacts, leads, and deals on-the-go. Many will also have the ability to manage a calendar, send push notifications, and set tasks and appointments. The concluding step for your CRM implementation is to test how all of the individual components are working together to help achieve your business goals. This is followed by reporting to measure success to goals and implementing ongoing training to increase user efficiency and adoption. Ideally, you have been testing the different features as you’ve implemented them. However, even if individual functions are working, you’ll want to test the platform in its entirety as if you were “live.” Consider all of the customer touch points as they connect with the CRM. Reports are only as good as the data. Make sure that the data you see in reports matches expected results. Then, make sure your team — particularly sales — knows how to keep things updated regularly in the system. 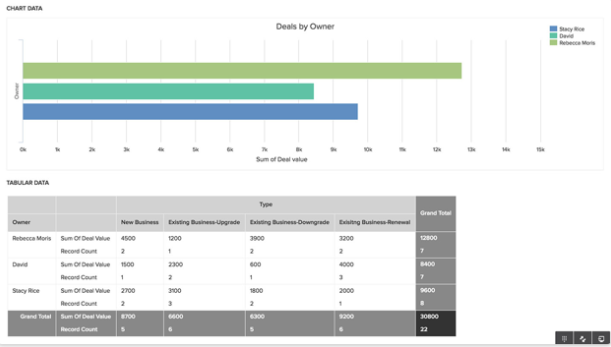 What you measure should tie back to your overall business goals — see the above section “Build Custom Reports” for examples on what to measure. If you’ve involved your team from the beginning, they’ve already been exposed to the platform. Beyond jumping in and using the CRM, ongoing training will be crucial to ensure that your team is using the software as designed. Trained, efficient users will be happier employees, which will lead to happier customers. 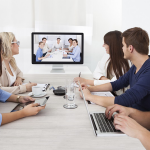 Use your CRM’s videos, support community, and enlist your vendor’s staff for periodic training calls, especially as new capabilities are introduced. Do I Need A Strategy Before Implementing My CRM? We highly recommend developing a CRM-specific strategy because it will inform every decision you make from selecting a CRM to deciding which custom contact fields you need. Check out how to create a CRM strategy. What Do I Do if I Have Trouble Migrating Data? Start by contacting your CRM vendor for advice. You can also try a company that specializes in CRM data migration like import2. Every major step of a CRM implementation: planning, implementing, integrating, customizing, testing, training, and measuring should link back to your overall business goals. By including your team in these steps from day one, you will set your company up for successful use and adoption of the platform. The CRM by Freshsales is easy to set up, intuitive, and full of customization options. It also has excellent 24×5 email and phone support included with all plans should you need help with implementation or using any of the many features. Visit Freshsales today to schedule a demo or start a free trial.